Stop by Booth #876, and Check Out the Fabulous New Packaging of the Crispy Fruit Product Line! FAIRFIELD, N.J. – September 26, 2018 – Crispy Green®, the maker of Crispy Fruit premium freeze-dried fruit snacks, will be exhibiting at the annual PMA Fresh Summit at the Orange County Convention Center, Orlando, Florida Oct. 19-20th at booth #876. You’re invited to stop by, meet the team, see the beautiful new Crispy Fruit packaging and learn why Crispy Green is the #1 brand! While you’re at the show, you’ll also be able to see the full Crispy Fruit line-up at the Main Fresh Idea Showcase! All seven flavors on display: apple, banana, cantaloupe, mango, pear, pineapple and tangerine. And if you can’t make it to the show, check out the new and improved website: www.crispygreen.com to learn more about this innovative brand and popular better-for-you snack line! 100% Pure Fruit, Nothing Else! Crispy Fruit is literally made from one ingredient only—fruit. Crispy Green’s sophisticated freeze drying process removes the water from fresh fruit, leaving behind the fruit’s true essence in a light and crispy texture. Clean, healthy and delicious, Crispy Fruit is an irresistible snack choice for kids and adults alike whether on the go, at home, school, office or in the car. Anywhere YOU go, GO with Crispy Green! Crispy Green is also a proud sponsor of the 5th annual Power Your Lunchbox Program offered by Produce for Kids, which encourages families and classrooms to pack healthier lunchboxes throughout the school year. Last year, over 48,000 families and classrooms made the promise to eat a healthier lunch, helping raise 880,000 meals for families in need through Feeding America! 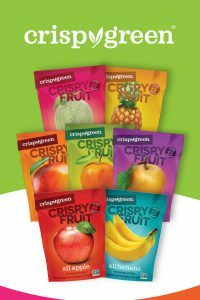 Founded in 2004 and headquartered in Fairfield, NJ, Crispy Green, Inc. is the number one freeze-dried fruit snack in the U.S., according to the latest Nielsen research, ending 6/31/18. The company’s category-leading Crispy Fruit line of 100% pure, freeze-dried fruit is made from only the finest, non-GMO fruits available with no sugar added (*not a reduced calorie food). Crispy Green’s purpose is to provide the highest quality, natural food products and inspire others to live a healthy and better life. Crispy Green’s Crispy Fruit can be found in many major grocery retailers nationwide as well as through Amazon. Crispy Green is a delicious, convenient way to add more fruit to your daily diet. For more information, visit www.CrispyGreen.com or our sister lifestyle site, www.SmartLifeBites.com. For news updates and special offers, you can also follow Crispy Green on Facebook, Twitter and Instagram.